This is Red Face. 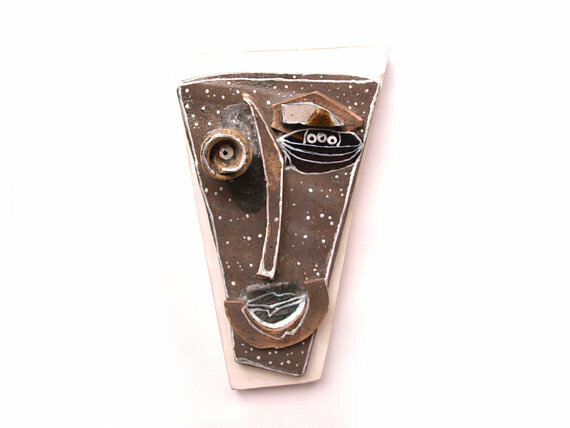 He is a very special handmade ceramic face, made in our 99heads studio. This art piece is different. We used a special sand technique when we integrated Red Face into the frame. 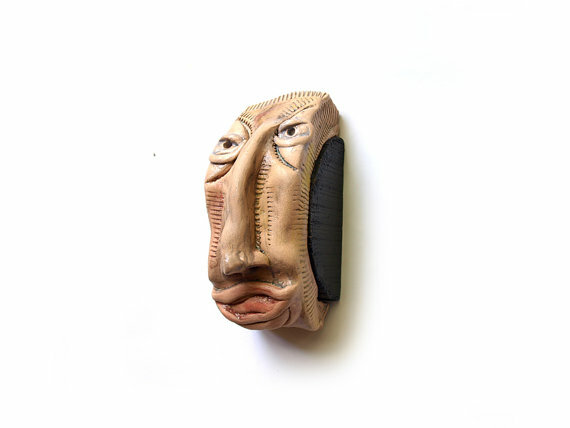 The face itself is made of red and white clay, the frame is wooden and the stuff in between is a special sand mixture, used to create a unique and rich texture as a background of the face. Redr Face was also glazed and painted on with special ceramic paint. He is different and unique, full of all sorts of shapes. 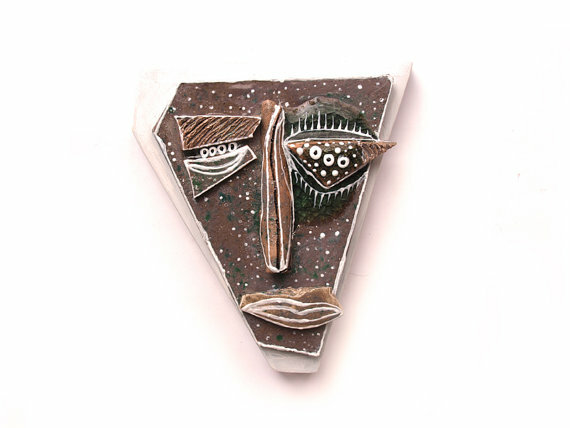 His facial features are made of small ceramic elements. The sandy background’s color is pinkish; the inner frame is red-pinkish, emphasizing the face; and the rustic frame combines several layers of white black and red, all of which are layered, using a special technique to create the rustic effect. The art piece has got a hook on the back for easy hanging. 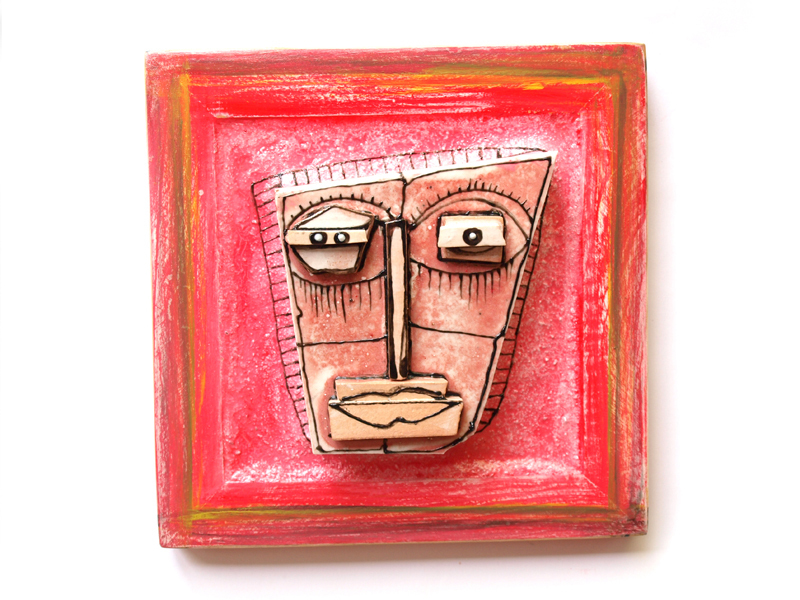 RedFace is a perfect addition to your personal collection or an awesome gift for someone very special. 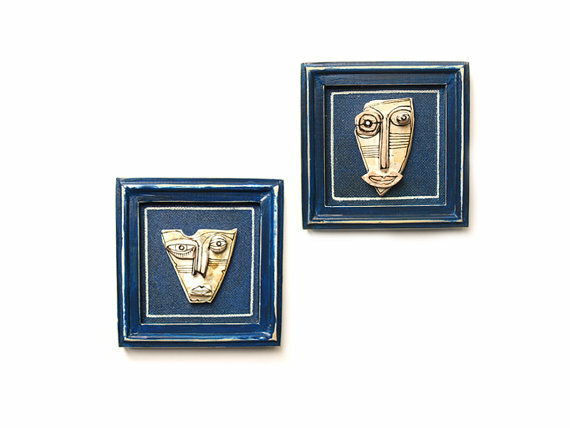 This is a unique wall art ceramic sculpture, designed to give your home décor the twist you’ve been looking for. We used a special wood in a semi-circle shape, painted in black with a hook on the back for easy hanging on the wall. 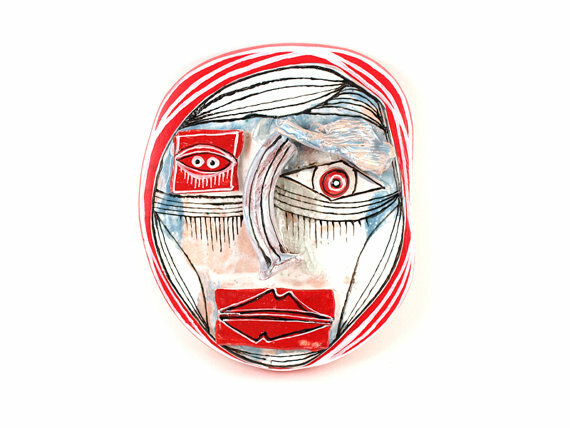 The face is made of white clay and then glazed with ceramic glazes in smooth light colors like blue around the eyes, red around the lips, etc. 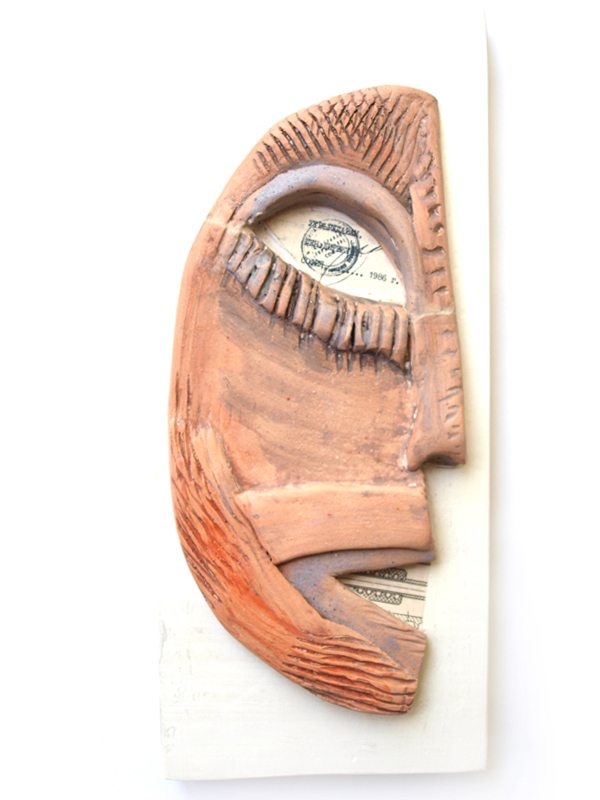 The head’s facial features are emphasized by the distinctive imprint we used to decorate it. It is suitable for a gift for someone special or an addition to your personal collection. 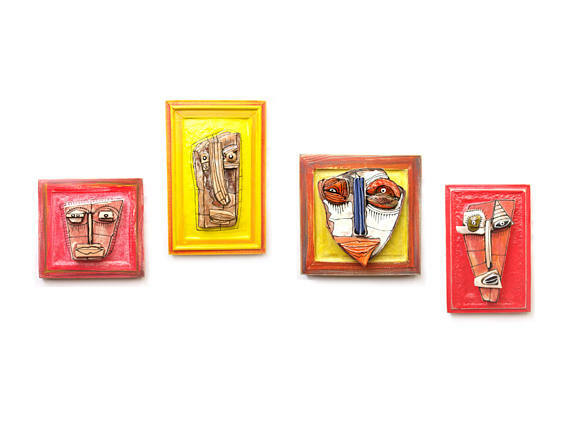 Apart from being an awesome art piece, coming out of the wall, it can also be turned into a practical piece of art by hanging it next to your bookshelf and use it as a beautiful artistic bookend. Have fun experimenting! He does have it, doesn’t he? It’s the eyes. If you look deep into his eyes you can see he’s been a good soul all his life. 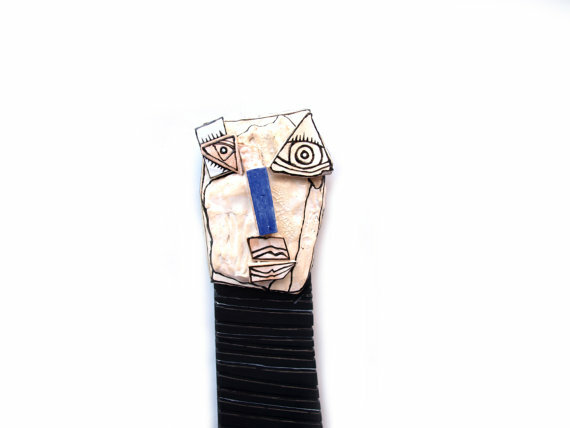 He’s in peace with himself and his balance is illustrated perfectly in his facial decoration: green/blue eyes, gently outlined through the freshness of the white/yellow skin; the black decorative lines are the perfect finish. 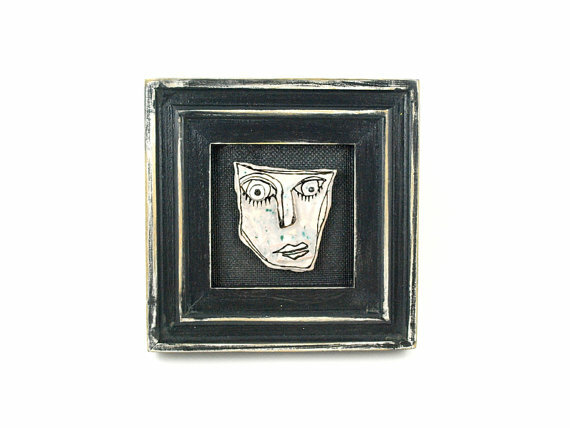 The face is placed on a white wooden board, creating a slight 3D effect when placed on the wall. There’s a hook on the back for easy hanging on the desired place. 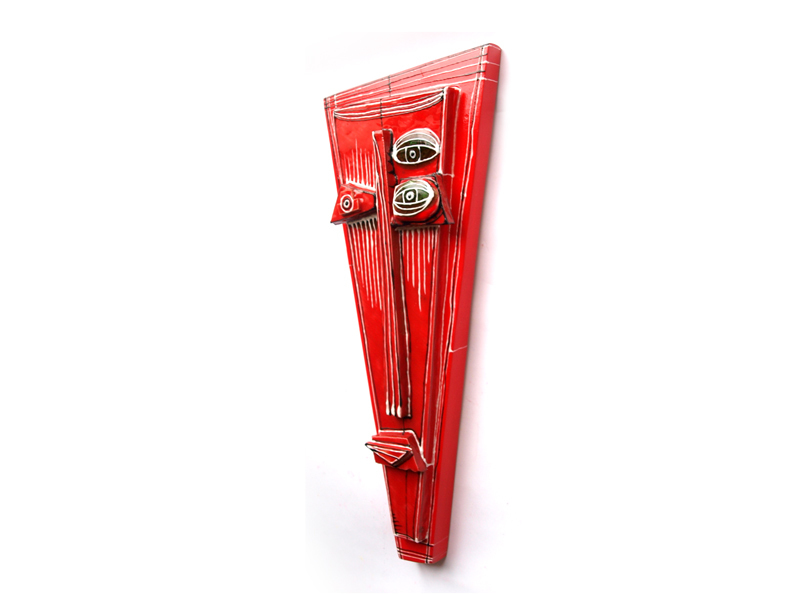 The art piece is perfect for a gift for someone special, as well as an awesome addition to your personal collection. 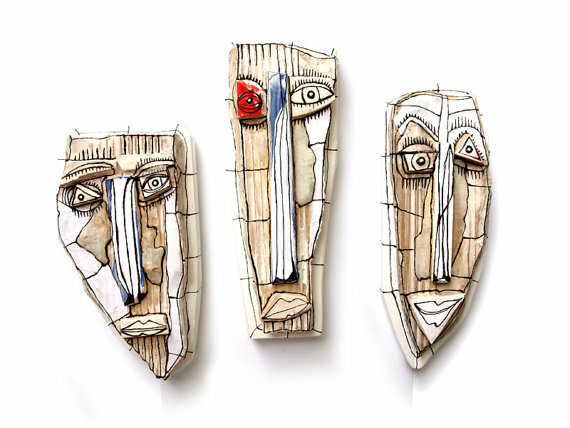 The faces of the sculptures are made of white clay elements, glass and ceramic glazes. 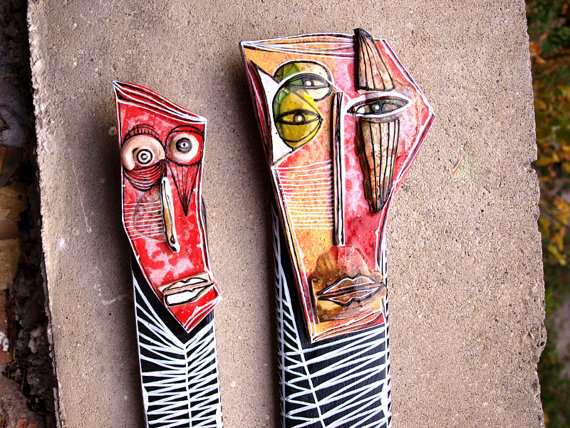 Their bodies are wooden and painted with acrylic paints. 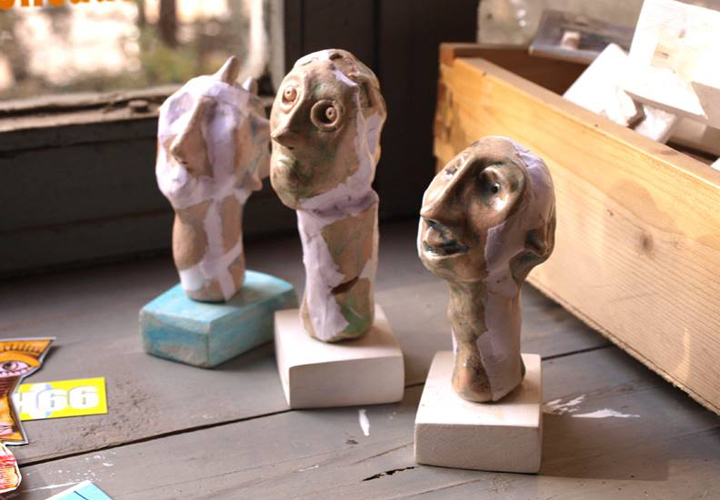 Each sculpture has got a hook on the back for you to hang it on the desired place and in the desired arrangement. 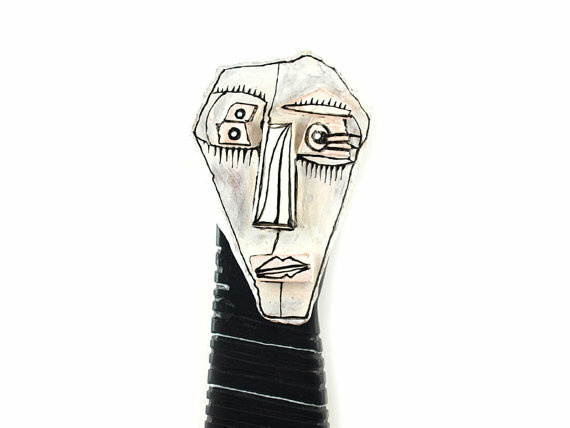 The abstract idea, implied in this face gives it a unique spirit and character. When you look at the sculpture, besides the face you see there, you can find many other things. In other words, this mask directly involves your imagination. 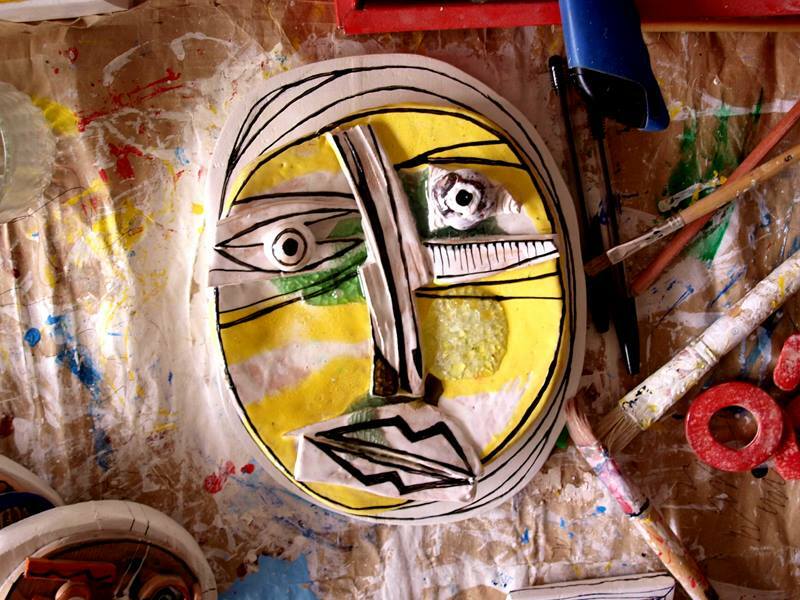 This mask is entirely handmade. 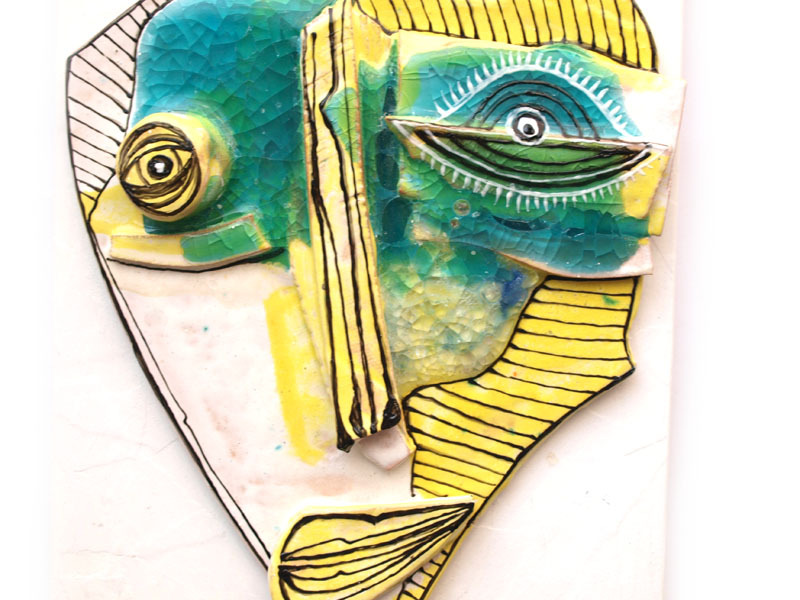 To make it we used multiple ceramic elements, ceramic glazes, glass, wood. 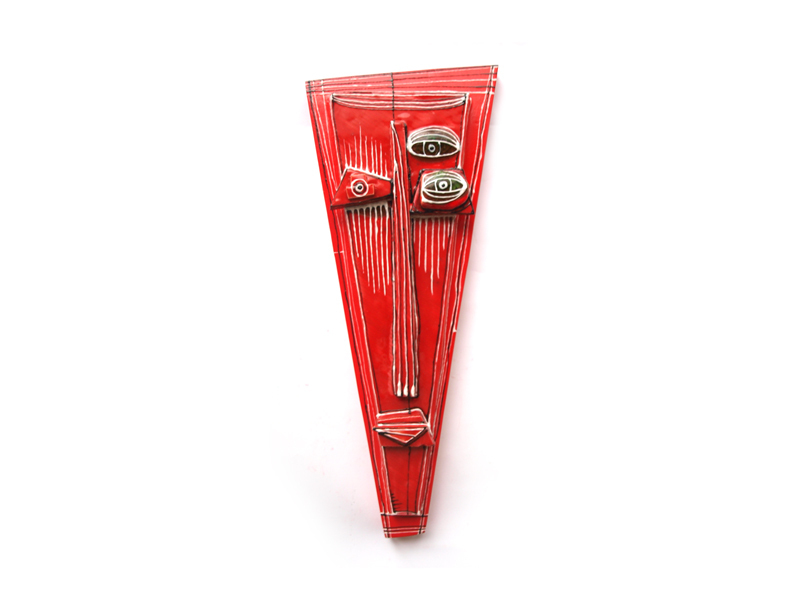 It is glued to a red wooden base .On the back of the mask there is a small hook, which you can use to hang it on the desired place. 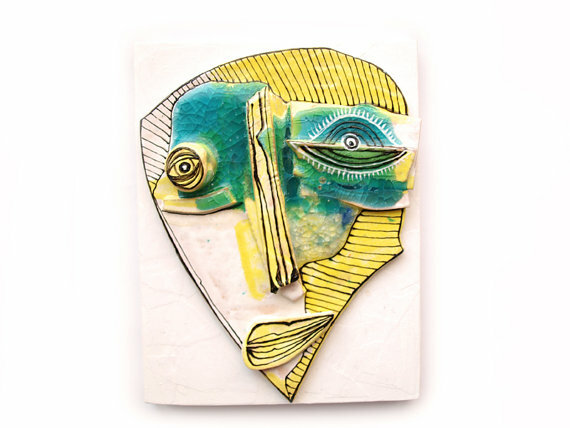 Here’s a ceramic 3D wall art mask that will brighten your room in a unique and artistic way. 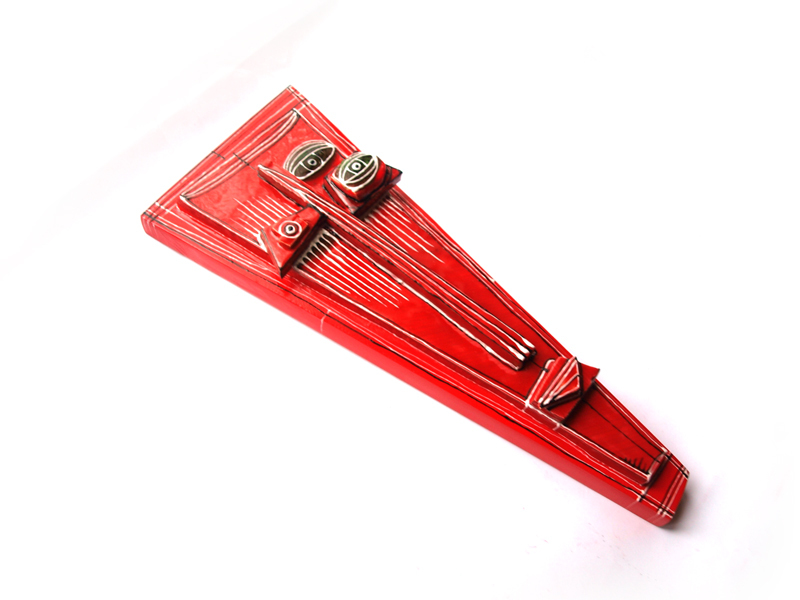 The back is made of white wooden board with a hook on the back for easy hanging. 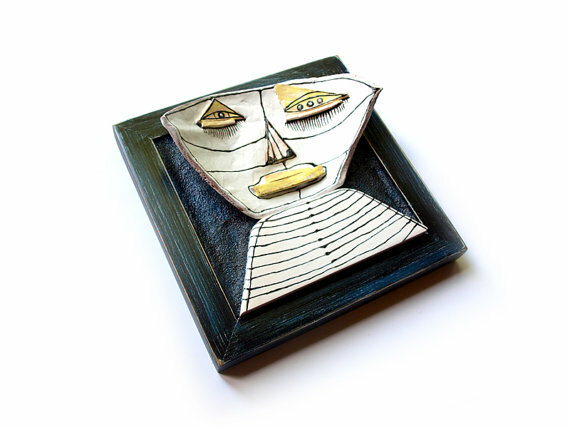 The face is made of white clay, baked and glazed with yellow glaze and dark and light green glass pieces, after which decorated with black lines emphasizing the entire art piece. 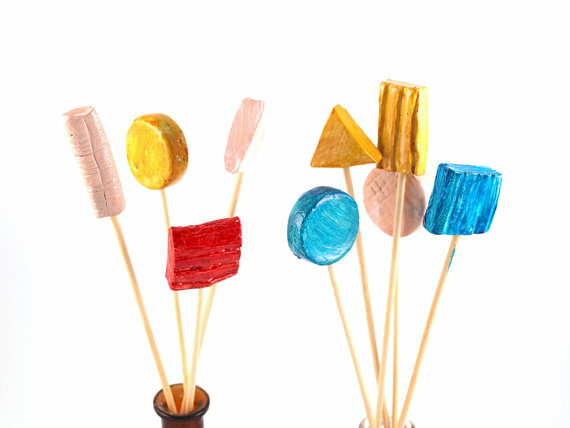 These colorful ceramic sticks come in an vintage pharmaceutical bottles (white and brown) . The combination between the two types of elements – one modern, one vintage – gives this spring decoration an amazing and unique charm. Perfect for your home decor, you can put it on your kitchen table or among other goodies on the shelf, trying to confuse the kids or “serve” it to your guests as a good conversation topic. Just don’t eat them, because they’re actually glazed colored ceramic pieces on a wooden stick (not so tasty). Have fun! We have 9 sticks and 2 bottles – one white, one brown.